In a practice that offers their patients comprehensive state-of-the-art treatment, dental surgery also plays an important role. Often, a surgical procedure is necessary when treating patients with acute pain or in connection with periodontal therapy or dental prosthesis. Our patients get the advantage of our many years of experience with dental surgical techniques. Since the founding of our practice in 1978, the entire range of surgical treatment has been available to our patients. For example, more than 5000 wisdom teeth have been removed within this time span. Our emphasis is on quick, pain-free procedures. Teeth that are damaged so severely that they cannot be cured or saved can be a source of acute pain. Another common cause of pain is inflammation, such as an abscess. Both cases require not only a precise diagnostic procedure, but also effective pain relief and immediate surgery in order to eliminate the cause of pain. One of the most common dental surgical procedures is the extraction of impacted wisdom teeth. Since they are the last teeth to grow out of the bone, they usually do not have enough space in the jaw bone. They can get stuck halfway or cause an array of other serious problems, which are often accompanied with strong pain. As usual, preventive treatment should be our choice. If x-ray findings raise the concern of possible problems with wisdom teeth, we will always advise our patients to have them extracted prophylactically long before the first problems arise. Furthermore, the results of jaw surgery are better if the area is not inflamed. Usually, we extract both wisdom teeth on one side in one session which takes approximately 20 minutes. However, if desired, we can extract all four wisdom teeth in one session. Whether you desire permanently attached or removable dental prosthesis, we can achieve a better adaption to the jaw and optimize cosmetic results by way of simple plastic surgery. This short overview presents some of the surgical treatments that we can offer you in our practice. 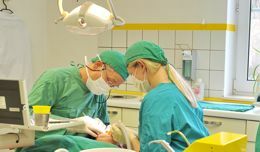 We will discuss the possibilites for surgical techniques in connection with implants and treatment of periodontal disease in the corresponding sections. Due to the great variety of procedures that we offer you, giving a detailed listing on this website is not practicable. In case surgical measures become necessary as part of your treatment, we will of course explain to you all of the possibile treatments and alternatives.